“Creating Unity Through Salsa”. What a beautiful concept! But, the question is, Can this be accomplished? You bet! In fact, this is the slogan used by Albert Torres Productions, who are truly, really making it possible. This was evidenced once again in the Fourth Annual West Coast Salsa Congress, which took place in the Hollywood Park and Casino, May 24-26, in Los Angeles, California. 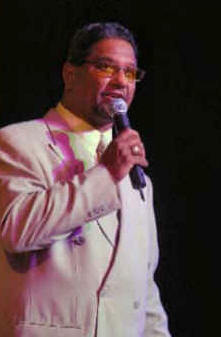 Albert Torres proved that he has the magic touch and that he is the number one salsa promoter in the world. And I can positively testify to that, this being the third congress that I attend. Success was the name of the game here, and I can’t possibly stress it enough! This is the second salsa congress that Albert produces without the Bacardi sponsorship, and it seems that it was the right move to do. If there is somebody that could do it, it was definitely Albert Torres. He has done the same in Japan, Germany, France, and other countries. He will also do them in Cuba and Africa in the future. Albert Torres is without any doubt salsa’s ambassador on planet earth. And, if he could do it in the moon, you can bet whatever you value most that he will. Forty countries were represented in the Fourth West Coast Salsa Congress, including The United Kingdom, Italy, The Netherlands, Norway, France, Sweden, Canada, Mexico, Japan, Lebanon, Israel, South Korea, Singapore, Malaysia, Taiwan, China, Australia, and others. These countries’ best dancers and dancing teams came all the way to the United States to show that salsa is alive and well all over the world. And they are really proud of their quality, as demonstrated in the dancing competition. Some of the dancing teams whose art graced the congress were: Dance Mix 2000, Descarga Rumbera Dance Co., Salsa Viva en Sapporo, Sweethearts, Salsa Sunrize, Sin City Salseros, Fuerza Gigante, Pawel and Dora, Salchevere, Rumba de Fuego, Salsa con Funkshon, Sisters of Salsa, Salsa with Attitude, Yemaya Salsa Dance Co., Francisco Vasquez and Los Rumberos, Paragons of Salsa Magic, Salsa Locos, Los Hermanos, Son D’ Hawaii, to name just a few. How do they come up with these names? Not even the new salsa bands think of these things. One striking aspect about the dancing teams in these salsa congresses is that they take their work very, very seriously. Every single detail is taken care of; there is no space for mediocrity. To these dancers, their art is top secret, and the level of competition is incredibly high. Not only the dancing techniques matter, but also the attire to be used at their presentation. All of this is very exciting to witness. In the end, it all pays off and the public gets one great show. If they can’t see it at the stage, they can watch it through TV monitors that are located throughout the event’s location. And it is a treat to look at their faces when they are watching these competitions. You can see that they are trying to learn, to absorb whatever they can from all these dancers. It is quite an amazing experience. But, for this writer, there is something much more important, the defining factor that makes it all possible: the music. And, like every year, there was salsa music playing at all times during the event, either by a live band or by a DJ. Friday, May 24, the first official day of the Fourth Annual West Coast Salsa Congress, was a special one, because we witnessed two great bands in action. The first one to come onstage was the eagerly awaited “Manolito y su Revolución Juvenil” from Puerto Rico. Led by 15 year old timbalero Manolito Rodriguez, these fellows gave us a good show. Comprised of young musicians — mostly teenagers — from La Escuela Superior Libre de Música, this group has a great future in the hands of young Manolito, who is also a great percussionist. Can you imagine a 15-year old kid conducting 16 musicians, including 3 singers, percussion, bass, piano, two saxophones, one trombone and two trumpets? Yep. That’s what we saw this day, and their repertoire included “Acereko”, “Timbalero”, “Trucutú” and others. According to Manolito, the music that they play is meant to preserve the classics, and they do it in a magnificent way! 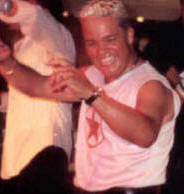 In addition of performing with his own group, Manolito was a guest percussionist for almost every single band that was scheduled at the congress. Revolución Juvenil was followed by LA’s own “Orquesta Son Mayor”, who generated a lot of electricity with their infectious rhythms. They are one of the few non Cuban bands that are trying to play timba, and they do it very well. It’s a show that shall not be missed. Can’t wait for a CD from these guys! Friday’s final act was Colombia’s hottest band: La Sonora Carruseles. I have been waiting to see these fellows again. After their performance last year at the Sportsmen’s Lodge, I needed another dose of their music. And these guys never disappoint! Under the direction of percussionist Diego Galé, some of the tunes that they played that night were “Para Ustedes”, Baile del Boogaloo”, “Arranca en Fa”, “Micaela”, “De una vez Gozando”, “Mambo Batiri”, “Mosaico Boogaloo”, and “El Pito”. This is one group that you don’t want to miss! The opening band for Saturday, May 25, was Freddie Crespo y su Mambo Review, from Los Angeles, California. As its name indicates, the format of this orchestra is big-band, and it will remind you of the glorious days of the Palladium. Crespo is a great bandleader and his band is truly meant to entertain and make you dance. It’s a matter of time before the rest of the world enjoys his music. José Alberto “El Canario” and his fabulous orchestra was the closing act for Saturday and, as usual, he delivered like the best. He has one of the most powerful bands around, with a great, energetic sound. He is also a great showman that can win any crowd. Plus, it is always good to see our beloved Fania All Stars trumpet player Mr. Héctor “Bomberito” Zarzuela. At the end, “El Canario” joined the conga player and performed a fiery rumba. As mentioned earlier, Manolito Rodriguez was invited onstage and jammed with the tumbadoras. What a show! Some of the material that we enjoyed that night was “La Paella”, “Discúlpeme señora”, “Chan Chan”, “Quiero salsa”, “Amada mía”, “Baila que baila”, and “Fatimata” (sang in French!). Sunday was a monster! On this day, May 26, we were lucky enough to attend a workshop at the LAX Hilton Hotel, featuring Oscar D’León and Ray de La Paz, in which they briefly gave us details about their lives. Unfortunately, Oscar couldn’t talk too long, because he needed a well-deserved rest after his flight from San Francisco. He had to be in top form for the presentation that night. I have seen Oscar’s show before, and I was anxiously expecting this one, too. Boy, was I in for a surprise! The night began with Johnny Polanco y su Conjunto Amistad, Albert Torres’ adopted kids. This is a great band that makes Los Angeles proud. In fact, I highly recommend ― like I have done before ― that you get a copy of Polanco’s latest CD, “Pa’l Bailador”, which Torres also produced. During their presentation, Polanco’s band played many hits from his CD. It’s amazing to see this guy performing; in addition of blasting the trombone, he also masters the vibes and the tres. A special moment was to watch veteran Newyorican singer Ray de La Paz join the band. If you are willing to remember, De La Paz claim to fame was with the late Louie Ramirez and the great Ray Barretto. It was a privilege seeing him performing. He is still a mayor force to be dealt with. Remember that I mentioned that Sunday was a monster? Here’s the reason: Oscar D’ León. This is an unstoppable force in the universe. Consider this: In the two-hour plus that his band was onstage, they performed, non-stop, “Llorarás”, “Bravo de verdad”, Sigue tu camino”, “Me voy pa’Cali”, “Detalles”, “Anabacoa”, “La vida es un carnaval”, “Calculadora”, “Ven morena”, “La Murga (de Panamá)”, “Cumbanchero”, “Parampapán”, “Oye como va”, “Que bueno baila usted”, “La flor de la canela”, “Toro Mata”, “La sitiera”, “Guantanamera”, “Yo quisiera”, “El Manicero”, “El Rey del timbal”, and more. He played all these tunes at their entirety! No potpourris here! Can anybody else in the business do this? The closest that I have seen were Los Van Van, when they first came to Los Angeles some years ago, and went on non-stop for 3 hours and 45 minutes. Oscar D’León, definitely, is the best showman in the business. And his band is tight, too, very well rehearsed. A funny moment, though, occurred when Manolito Rodriguez went onstage as a guest timbalero. There was battle of timbaleros, featuring Manolito, Rudy Regalado, and Oscar’s timbalero. Manolito was so good that you could see Oscar instructing his guy to wake up and don’t let the kid steal the show! Manolito did this every single opportunity he was invited to participate as a guest with a featured band. Some of the timbaleros politely stepped aside and didn’t play the game. Good for them. But this night is one to remember. If Oscar D’León is in your town, even if you spend your lunch money, go and see him. He will give you your money back and more! After Oscar D’Leon’s presentation, it was only a couple of hours before the congress was over. Albert Torres closes this event by making everybody dance together, as a symbol of brotherhood and sisterhood, giving real meaning to his motto of “creating unity through salsa”. This year was no exception. As always, I will eagerly wait for next year’s congress. I already know that it will also be a success. That’s a fact, folks. Acknowledgements: It is my sincere pleasure to thank my friend and mentor Albert Torres, his lovely wife, Maya, as well as their great staff, for all they do for yours truly and his band of locos. They are the best, period. My sincere thanks and love to my good friend, Cynthia Semon, for her unconditional support of whatever I’m trying to do. Albert couldn’t find a better PR. My gratitude to my compañeros de batalla, Bruce Brewer and Antonio “Kako” Nuñez, for being the best team that there is. Kako came all the way from Panamá to Los Angeles just to witness this event. I know that his dream came true. And so did ours.